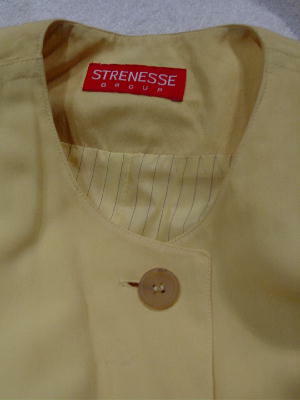 This light lemon yellow Strenesse Group jacket has a deep jewel neckline and 5 buttons down the front. Only the top button is visible, as the other 4 are covered by a placket which has an outer edge of double stitching and two arrows (one at the top and the other at the bottom). 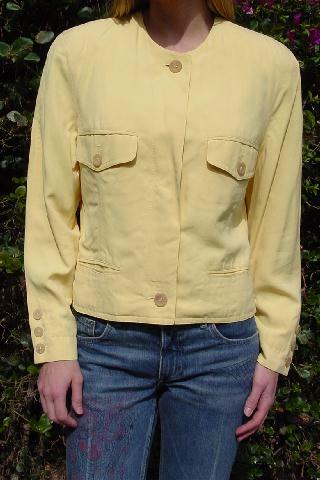 The front has four pockets, two in the center with one button flaps and two lower open pockets. The long sleeves have three buttons on each one. The jacket is 80% cotton and 20% silk. 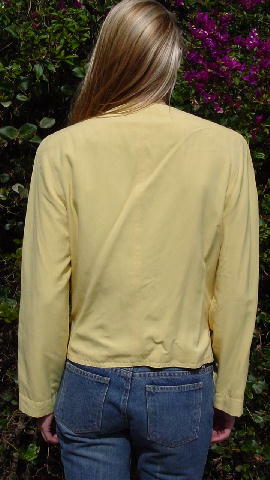 The lining is 100% viscose and is a light lemon yellow with pinstripes in light blue. It belonged to a German model who needed some cash. shoulder pad to shoulder pad 20 1/2"
shoulder pad to end of sleeve 22"
armpit to armpit 19 1/4"